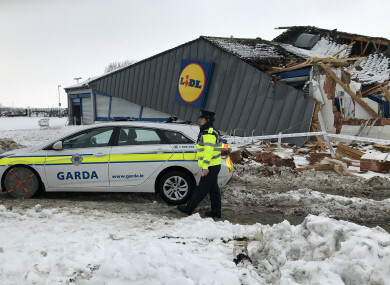 GARDAÍ IN TALLAGHT have begun an investigation after thieves made off with a large quantity of copper during an early morning raid at the Lidl store that was destroyed during the snow in March. In the early hours of Saturday 11 August, “a large amount of copper piping and wire” was removed from a food supermarket premises on Fortunestown Lane, a garda spokesperson confirmed to TheJournal.ie. The store is due to reopen this month after the damage caused by looters during Storm Emma earlier this year. Dramatic video footage of a digger ripping the roof and side wall of the store was shared widely on social media during the red alert weather warning that brought heavy snowfall across the country at the beginning of March. Eight men – aged between 24 and 47 – were charged with various offences including theft, burglary and trespassing arising from the incident. Staff at the store were redeployed to other areas of west Dublin while the Lidl store was rebuilt. In a statement last month, Lidl said the new store would be “new and improved”. “The store will incorporate features such as heat recovery, LED lighting, sensor controlled exterior sun blinds to reduce unwanted heat from the sun, and high insulation external cladding,” it said. Despite the latest thefts from the store this month, the Lidl store on Fortunestown Lane is set to reopen as planned on Thursday 30 August. Gardaí said that no arrests had yet been made in relation to the thefts, and that investigations are ongoing. Email “The Lidl looted during the snow has suffered a large robbery weeks before grand reopening”. Feedback on “The Lidl looted during the snow has suffered a large robbery weeks before grand reopening”.